4-1/2x 6x 8-1/4" tall fresh from the mine rock crystal cluster with sandstone, clay, and iron oxide matrix. Ready to reside in your garden if it's protected from direct sun and cold [crystals CAN overheat, fracture, or even explode]. Rare multi-colored rainbow iris; TWO extremely rare reverse scepter crystals; laser crystals - one with NINE faces, also extremely rare; shale inclusions. 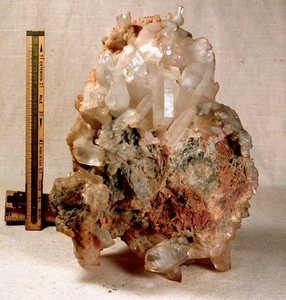 Penetrated crystals; at least FOUR crystals with uncommon 7h faces; tabular crystals and twins; doubly terminated crystals, too. One side of the cluster, which looks rather flat in the photo, is elestial - in regrowth. Pricing takes into effect minor extraction damage. Fabulous as is, or ask us how you can clean the cluster with oxalic acid. Sent doubly-boxed [no gift box] with hand written description. Shipping will be added.